Proper mirror adjustment probably is the most important part of preparing to drive your motorhome. Did you know that almost 30 percent of the hazards you encounter come from the rear? This is why getting the maximum viewing area from your motorhome mirrors is so critical. Let’s take a look at my top 7 tips for maximizing your motorhome mirrors. For the most part, there are two types of mirrors commonly found on motorhomes: the type that extend out in front of the motorhome on long arms, and the type that are fixed to the sides of the motorhome. I will include both types of mirrors in this article. 1. If you have the type of mirrors that extend out in front of your motorhome on long arms, make sure the inside edge of the mirror is flush with the side of the coach. On the majority of motorhomes we inspect, with mirrors of this type, the mirrors are not set correctly. ILLUSTRATION 1: Motorhome mirrors set too far in, just right, and too far out. Note: Some coaches taper in on the front and can give you a false setting, so make sure you are looking down the side, not where it is tapered in. 3. On the passenger side of the coach you should set the mirror flush with the outside edge of the awning arms. If the mirror is too far in or out, you are losing valuable viewing area. 4. 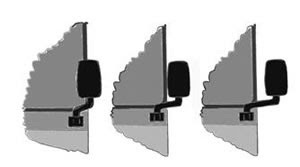 On some coaches the driver’s side mirror is located in such a way that when you have the mirror flush with the side of the coach, the corner post gets in the way. If this condition exists, consider swinging the arm around to the back so the mirror is visible in the driver’s side window. This is what is done on most motor coaches. This will also give you more room when maneuvering in tight places. You may have noticed that many of the newer coaches come with the driver’s mirror mounted on a short arm on the driver’s side. ILLUSTRATION 2: Shaded areas show lost viewing areas. 5. If the mirror is too far in and you set the mirror looking straight back along the side of the coach, you lose viewing area to the outside. 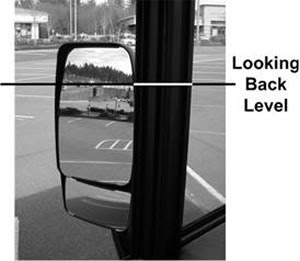 If you set the mirror so you just see the front edge of the coach on the inside edge of the mirror, you are creating a blind spot alongside the coach. ILLUSTRATION 3: Looking back level with the ground about one-fourth the way down. 7. If the convex or “spot” mirrors are independently adjustable, set them the best you can so you can see out horizontally to the ground and alongside the coach. Most people do not use their convex mirrors for general driving because it is not easy to see any detail. You may not see the detail, but the fact that you are seeing a much larger area gives you an advantage. Think of your spot mirrors as early warning devices. They warn you of a developing situation around you in order for you to take needed action. It may take several seconds for what you see in your convex mirror to show up in the flat mirror, if it ever does. 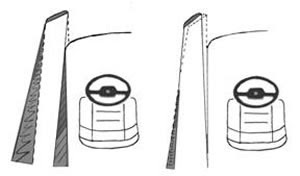 When set properly the convex mirrors should be used as much as the flat mirrors for general driving. If you don’t have independently adjustable convex mirrors, consider installing some. There are many types and kits available. The next time you are preparing to head out on a trip, take a minute to adjust your motorhome mirrors properly. You’ll be glad you did when you can see everything going on around you, especially from behind. These mirror tips are from our Drive your Motorhome Like a Pro DVD. I would like to thank Lorrin Walsh, professional driver, author and co-host of Drive your Motrohome Like a Pro DVD, for his contributions to this article and the DVD.